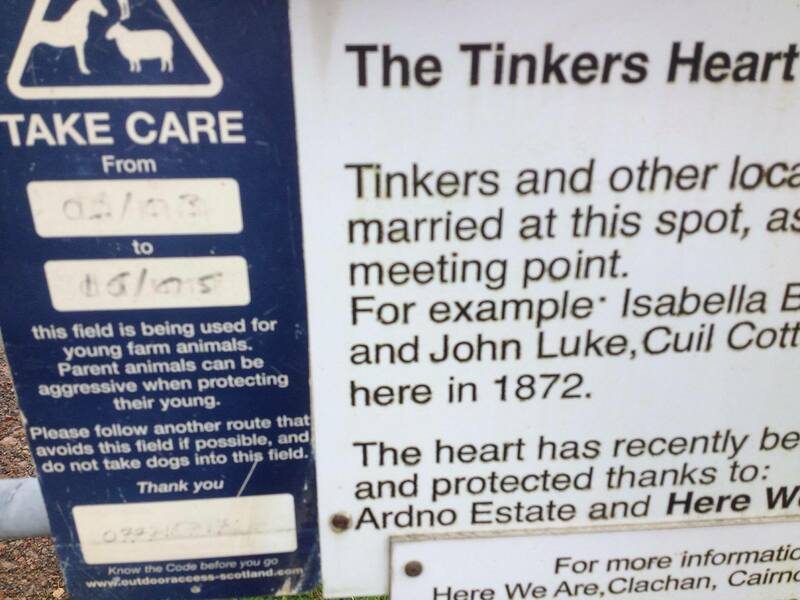 The Tinkers’ Heart is an Historic Monument – a scheduled monument of national importance. And this sign appeared over the summer, discouraging visitors. Someone needs to have a serious word. A tactic not exactly unfamiliar to many and completely uncacceptable given the Heart’s status. HOTT are currently running a film project about Traveller identity and what it means to Travellers. We would like as many Travellers aged 10 – 20 years, to become involved. What we want is to have voice-only recordings of young Travellers talking about their culture. We will then include these recordings in a DVD which promotes Traveller identity. 1) Use a mobile phone to record yourself. 5) If you are under the age of 16, could you also state your first name within the recording. Then print-off the consent form, have your parent/guardian sign it and send a photograph of it along with your recording. You can record your Parent/Guardian giving verbal consent for us to use your recording. Then send this recording to us along with your own. Do you remember when you were a child and you had sweeties that you just wouldn’t share? Not because they were extra special to you, just because they were yours and you didn’t see why you should share them? Not even if the more sensible part of you knew that by sharing, life could be so much better – not only for you, but for a lot of people around you? Imagine the lesson about what you share is returned to you many times over was one never learned. This is the situation holding hostage the Tinkers’ Heart. The Heart beats again to the rhythm of a culture, waiting to be loved and shared once more with the Traveller and Settled community alike. A Heart that won National Monument Status after a long, hard slog to get those concerned with such matters to recognise that yes, this place is important to so many people. Yet the Heart is in the clutches of someone who seemingly won’t share their metaphorical sweeties and is suffering broken promises from Argyll and Bute Council. The landowner rents the field where the Heart is out to a cattle farmer. They’re very lovely beasties: great big Heilin Coos that would happily grace any picture postcard of Scotland, all orange shaggy fur and big horns. You know, the kind of picture card tourists like to send home. What tourists won’t like, if they’ve any sense, is to get up close and personal with the live animals. Nor will they like to navigate their way through cow pats to reach the Heart. The Heart doesn’t like the cows much either because they scratch themselves against the cage that is meant for protection. They leave dung around the perimeter. 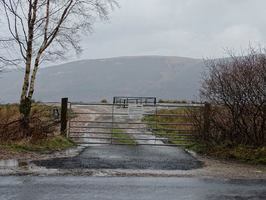 Add to that the dump of tarmac at the gate on the road and the perilous path of stones and small rocks that suddenly appeared and you’ll get the idea that this is not an attractive visitor location. It won’t be long before the cattle break the cage – what then for the Heart? 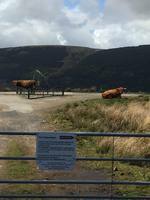 Argyll & Bute council promised signage and the opening of an old layby for parking. Neither has happened. Our Committee, who fought for the recognition and scheduling of the Heart, have put plans forward to enhance the location that is in keeping with the natural landscape. We have asked to buy the small piece of land where the Heart lies – all to no avail. These sweeties are not for sharing. 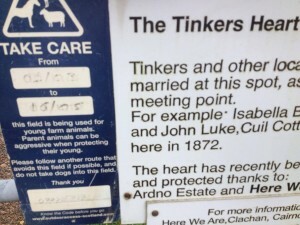 The Heart is important to the local settled community too – Here We Are is the local heritage organisation based in Cairndow and they have done sterling work in the area. I get the feeling they would be happy to work together with us to make this little spot a happy place, a tourist destination and a place whose importance to both communities is celebrated. But they are in the unenviable position of being between a rock and a hard place. They have done their best in difficult circumstance but it’s not their bag of sweeties. If it were, they’d have passed them around long before now. And that’s where we are with this. Once the new Parliament convenes on Thursday, we’ll get moving with a new petition. In the meantime, please spread the word about the site and the true reason for its neglected state.